This vintage silver plated 1950s necklace features a diamante embellished chain with a statement crystal design surrounding dark blue oval gems. A small quantity of rhinestones is missing, but this is barely noticeable when being worn. This necklace measures 16 inches and fastens with a hook clasp. 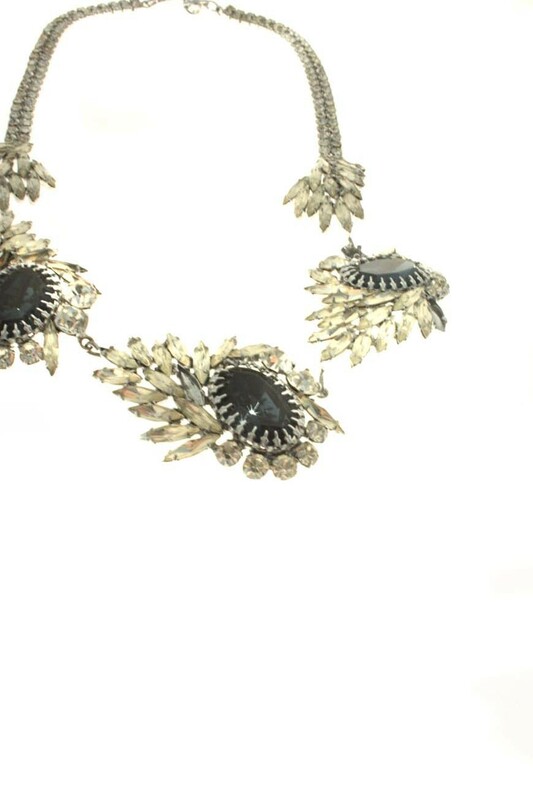 This vintage style necklace is on a long length plated silver chain. The pocket watch measures 2 inches across and has a flip open front, operated by pressing the button on top of the watch. It has a filigree design casing, with Perspex windows, allowing the gold and silver clock mechanism to show through. This vintage silver plated original 1950s necklace features a diamante embellished chain with a statement crystal design surrounding dark blue oval gems. A small quantity of rhinestones are missing, but this is barely noticeable when being worn. This necklace measures 16 inches and fastens with a hook clasp.